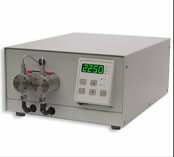 A zero dead volume connection is important for maximum chromatographic performance. Unswept volume, caused by a poor fit between tubing and the mating seat, can cause sample dispersion and unsatisfactory chromatographic results. Poor fit of the tubing can be due to a cut edge that is not square, or by improper deburring. Burrs may prevent the tubing from fully seating and may restrict the internal diameter. 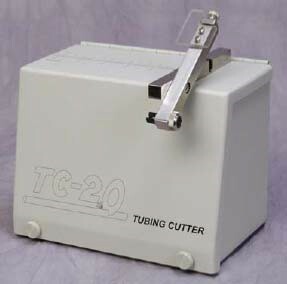 The Model TC-20 tube cutter assures a zero dead volume connection. Because tubing is held securely in a clamp vise on the vertical swing arm, a square cut is produced when the swing arm is lowered against the abrasive cutting wheel, which produces a finished end. No lubricant or cutting fluid is required. 1/16″, 1/8”, and 1/4″ outside diameter tubing with inside diameters as small as 0.008″ can be smooth- cut and dressed without distortion. The precision ground dressing tool for 1/16” OD tubing is included and is attached directly to the swing arm so it cannot be misplaced or lost. Simply place the cut tubing end in the tool and rotate the knurled handle to finish both the internal and external diameters of the tubing in one operation. If desired, the dressing tool can be ordered and used separately from the tube cut-off machine. 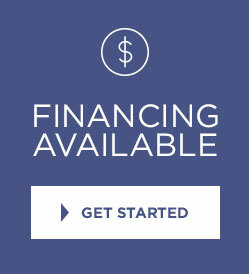 The tool for 1/8” and 1/4″ is optional. wheel, making the operation safe and simple.